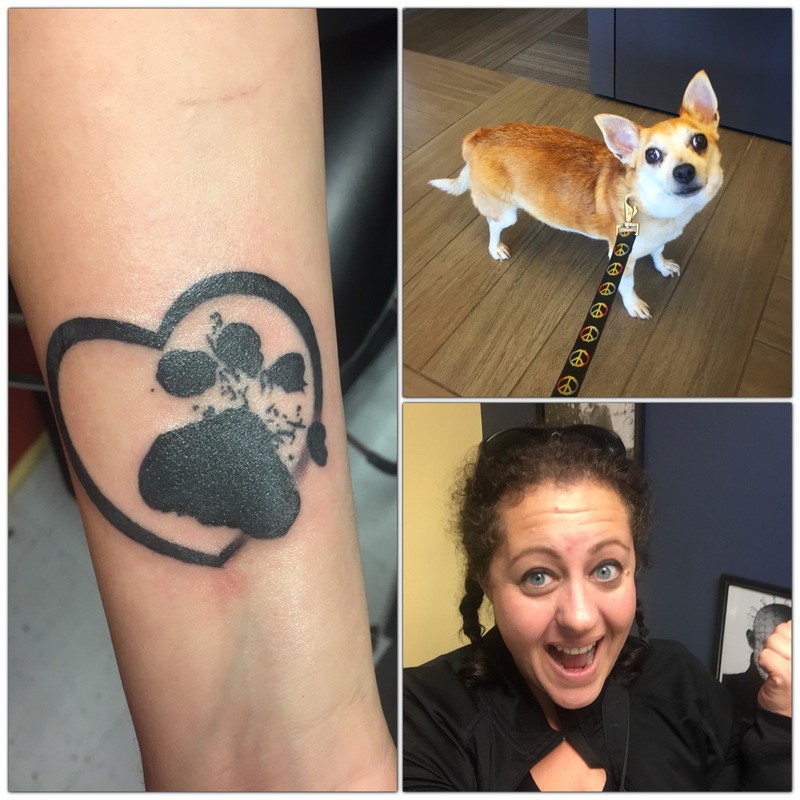 Just over a month ago, Sept. 3, I got something I have always wanted – a tattoo of Toby’s actual paw print. I have wanted this for as long as I could remember. My problem was that I didn’t know where I wanted it, and I didn’t know exactly when I wanted to get it. When Toby was diagnosed with lymphoma, getting the tattoo was even more important. In fact, the morning we found out he had lymphoma I went to the craft store and got everything we needed to do a quick paw print before we took him to the oncologist for the first time, because I was so afraid he was going to tell me I was going to have to put Toby to sleep right then and there. As we all know that wasn’t the case. But, as Toby continued to do well, I sort of forgot about doing another a print, until the middle of August. My aunt had wanted a tattoo for her 60th birthday and I wanted to get one with her. Getting Toby’s paw print while she too got a paw print of her heart dog, seemed so appropriate, since she is to blame for my love of animals. The timing my friends, could not have been better. We got it Sept. 3, in what was a totally happy, exciting life event that despite a lot of issues leading up to it, worked out perfectly for that weekend. Toby passed away Sept. 11. When I first talked about the tattoo, some people suggested I wait till after he passes away, and do it as a memorial of him. I originally thought that was a great idea. Now, I would tell someone never to wait. I am so glad I did it when I did. When I got home from getting the tattoo, I told Toby, “now you will be forever with me. However, that doesn’t mean you can do anything stupid [like die]!” For some reason I always wanted it on the inside of my right arm. Oddly enough, I have learned that when I sleep on my left side, the inside right part of my arm is right against my heart. So Toby’s paw print is right on my heart. Sounds silly, but it comforts me. The design for Toby’s tattoo came from a sticker I saw in store in Lake George. I saw it about three years ago while my friend and I were talking around. I said to her, “this would make a great tattoo, but with Toby’s paw print instead of a random one.” I snapped a photo and always kept it in the back of my mind. I played with some other ideas in my head, but in the end, I knew that’s what I wanted. A month later, I am happier than ever that I did it when I did it. Everyone goes through their own cycles when their dog is sick or passes away. For me, looking back, it was better that I did it while Toby was still alive and healthy. When I look down at his paw print, I think so many happy things. It makes my heart smile. What a wonderful way as a remembrance of your dog.